When a location for a church is inaccessible by truck, how do building supplies get to the site? In Tripura, India, people hand-carry them. Though the parts are heavy, the congregation is happy to help build their new church in any way possible! The projects in Tripura are Maranatha’s response to a request for 27 churches in the region. Located in the northeastern part of the country, Tripura is staunchly Hindu. The neighboring state of Mizoram, which is predominantly Christian, has been sending missionaries into the villages of Tripura since the 1990s. Now, the growing congregations are in need of churches. The Maranatha churches will provide a sense of place and stability for the new Christian congregations. 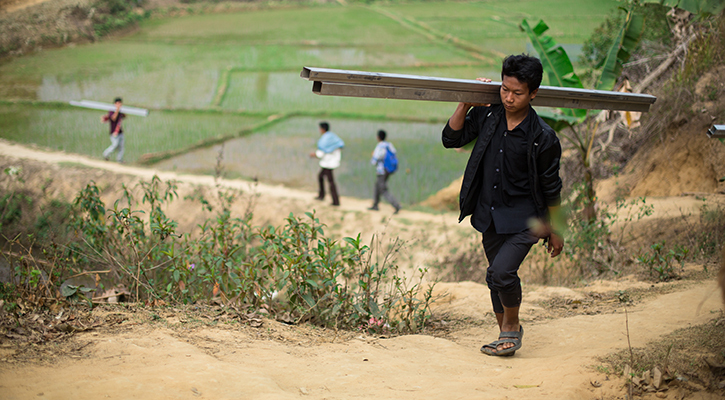 Many of the congregations are in remote areas, inaccessible by vehicles, and members have been hand-carrying the building materials for the churches. Many Tripura churches were sponsored by donations from The $10 Church. Thanks to the contribution of just $10 a month from thousands of people, Maranatha has been able to build several churches a month!